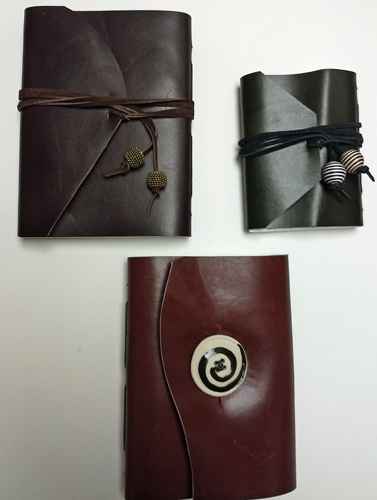 I am sharing my knowledge of bookbinding with a friend, and this month we each made 3 leather long stitch books. I only made two previously, in 2013, and we had to work out many of the details re: making a jig and then punching the leather. I bought 8 pieces of shoe leather scraps for about $1 each and only had used 2. We split the other 6 and each made 3 books. The maximal size possible was 7" high. I used Mohawk 24lb extra-white paper that I purchased on sale at Talas - 100 sheets for $5 - and was delighted that the only pen out of a combination of ballpoints and drawing pens that bled through the paper was a Sharpie. They were 8 X 10" and grain short. 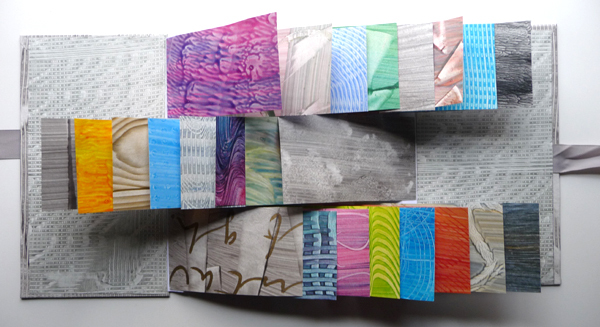 These are the spines - photographed while wedged between 2 bricks wrapped in plastic as bookbinding weights. My major reason for making books is to have a watercolor sketchbook that meets my needs, and isn't expensive to make. 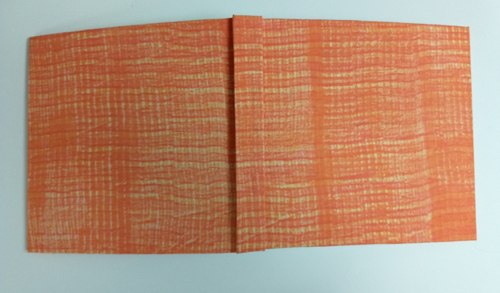 I make cased in books with dyed fabric covers for my standard watercolor sketchbooks, but this month my bookbinding student and I made Coptic books. They also open flat. 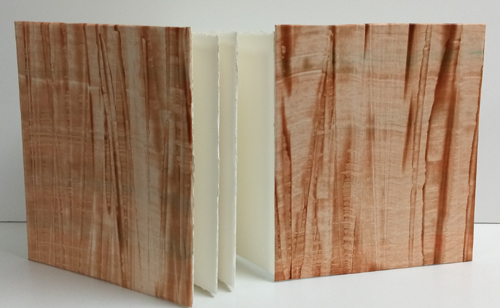 I made this book with a single sheet of Fabriano Artistico 140 lb soft press paper (3 signatures with 2 folios for a total of 24 pages) and a paste paper cover. It is approx. 7.5 inches square and watercolor can be used on the front and back of each page. The paste paper was made with a corn starch recipe and inexpensive acrylic paint. The end paper is a piece of decorative paper in a similar color. The stitching was done with 3 ply linen thread. 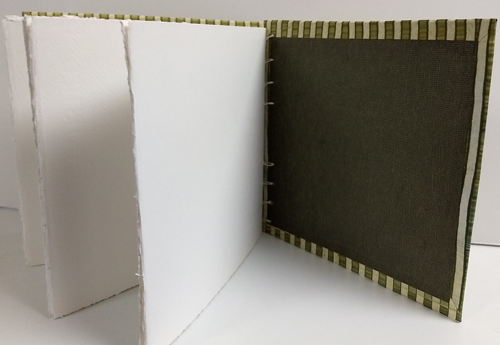 I chose this stitching method because there are two loops of thread through each cover hole, and the last signature and the front cover are sewn on separately. We used a large awl to make the holes and it was hard to punch through the cover binder boards. I'd love to know how easy it is to punch holes into Lineco 0.067 binders board with a Japanese screw punch - and what size punch is best. This is only my 4th Coptic book in 5 years, so I haven't invested in one. 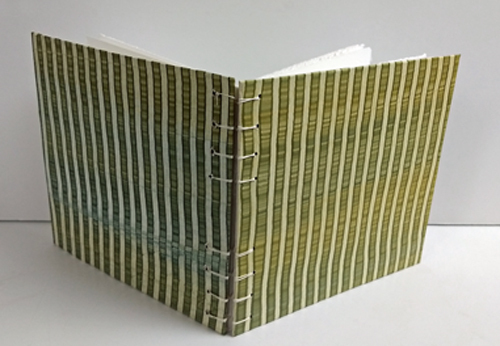 Once each month I meet with a friend to teach her bookbinding. She makes wonderful books and I have a new one for myself at the end of the day. 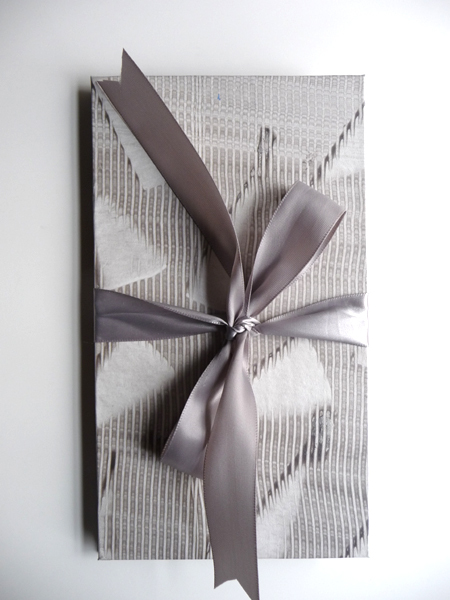 This month we made a cased in-book with 140 lb Fabriano Artistico soft press paper - 6 signatures with two folios each. 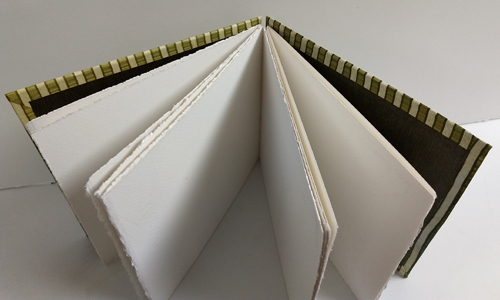 The cover for my book was made with fabric fused to 45gm mulberry paper. It is a monoprint that I made with thickened Procion MX dyes. 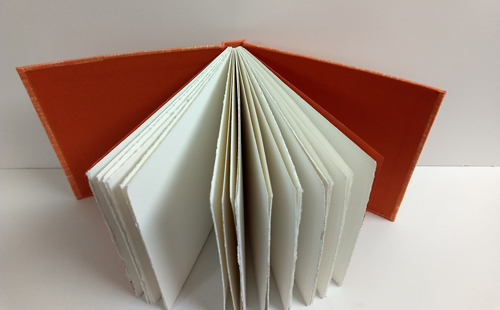 We made the end papers with Canson MiTientes paper - which is readily available in many colors. Ten years ago I couldn't find sketchbooks with good watercolor paper and began this journey. Now, although Moleskine and Stillman and Birn sell watercolor sketchbooks, I still love making these and have a wonderful shelf full of many color sketchbooks.